The Stone Lion Inn of Guthrie has been investigated by numerous paranormal teams due to creepy, unexplained incidents that happen within its walls. It begins with the uneasy feeling that you’re being watched as your adrenaline surges and the hair on the back of your neck stands on end. Next, you just might feel a chill that wasn’t there before. You may catch a glimpse of something not-so-human from the corner of your eye, or smell a whiff of perfume with no identifiable source. Open your mind to the spine-tingling experience provided by Oklahoma’s most haunted hideaways and put your courage to the test as you become immersed in an eerie tale of ghostly manifestation. Whether you’re a skeptic or full-fledged believer, read on to discover tales of ghosts, spirits and dark happenings in some of Oklahoma’s most prized museums, theaters and B&Bs. Not convinced? Venture into these alleged hotbeds of paranormal activity and judge for yourself! 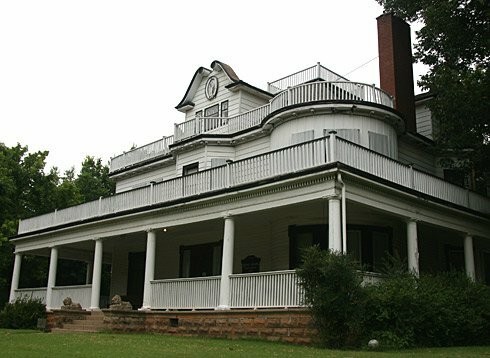 Stay at the Stone Lion Inn Bed & Breakfast in Guthrie at your own risk, as a mischievous ghost child has been seen and felt throughout the home. The spirit, said to be that of 8-year-old Irene Houghton, has been known to squeeze the toes of sleeping guests or even crawl into bed with them. The eerie tap-tap-tap of a child’s footsteps has also been heard leading from the second floor to the third. According to legend, the 8,000 square foot home was where the child met her fate when a nurse overdosed her with cough syrup containing opium. The family later moved on, but little Irene refused to leave. After the Houghton family moved out, the home changed into a boarding house and then a funeral home. Paranormal investigative teams have encountered several other ghosts, including a strong male entity who lingers in the basement where the morgue once was. Get into the spirit of things at the Stone Lion with an overnight stay, or if you’re brave enough, sign up for one of the inn’s famous murder mystery events. Strange whispers in the dark, the mysterious slamming of doors and a long-deceased Tulsa oil man can all be found at the famed Gilcrease Museum, the site of several paranormal investigations. The year was 1913 when the young Thomas Gilcrease first spied the land that would later hold his legacy. A multi-millionaire and oil baron by his early twenties, Gilcrease began collecting oil paintings, artifacts of the American West and Native American artwork, a nod to both his love of European art collections and his native Creek heritage. This collection, acquired over a lifetime, is now housed at the Gilcrease Museum, which is rumored to have a high turnover rate for night security guards. A collector until his death in 1962, it seems that Thomas won’t let death separate him and his beloved art. He’s often spotted wandering the grounds of his original rock house, referred to as “Tom’s Place” during his lifetime. The oil man also seems to enjoy a stroll along the museum’s garden pathways leading to his remains, which are housed within a mausoleum on the grounds. Visitors to the Gilcrease gardens may also spot the ghosts of several Native American children running throughout the gardens, as the original house was used as an orphanage when Gilcrease was away on business. This young woman has appeared quite frequently for theater workers and when spoken to, she sits quietly and appears to be watching something no one else can see. The patients of botched surgeries are said to lurk in this hospital-turned-museum, located in western Oklahoma near the area known ominously as “No Man’s Land.” From the unwavering gaze of mannequins to the uncomfortable feeling you get while roaming through the Cherokee Strip Museum in Alva, it’s hard not to feel like you’re being watched. If the otherworldly aspect doesn’t have you running for the hills, the creepy displays will, as there is a wide array of vintage medical instruments including an embalming table. The building has seen its share of death since it was completed in 1932, and whether or not you encounter paranormal activity at the museum, you’re sure to come across the bricked up second and third story of the building, a player piano that seemingly plays at random and a mysterious blood spot on the floor that refuses to be washed away. A strong-willed female ghost named Aunt Jane is rumored to haunt the grounds of Fort Washita in Durant. Built in 1842 and used until the Civil War broke out in 1862, Fort Washita was the home of Aunt Jane until she was murdered by roving thieves when she refused to tell them where her money was hidden. In a vicious struggle, the thieves beheaded Aunt Jane, and her remains were scattered and buried on Fort Washita. Aunt Jane kept a relatively low profile until the late 19th or early 20th century when her spirit allegedly possessed a child named Molly Stalcup who lived near the fort. Aunt Jane threatened to cut off all of the child’s hair and only fled after Mrs. Stalcup began praying. Today, visitors can tour the grounds of Fort Washita including the officers’ quarters and original sandstone structures. The fort also hosts the annual Fur Trade Era Rendezvous, a popular reenactment of wild frontier days. In a dark theater, it’s sometimes hard to tell who belongs there and who doesn’t. If you’re visiting either the Constantine Theater in Pawhuska or the Poncan Theatre in Ponca City, you may want to steer clear of the balconies, where it’s said that ghostly visitors often appear. Theater patrons at the Constantine describe the ghost as a beautiful young woman garbed in a button-down dress. Some claim she’s Sappho Constantine Brown, the daughter of George Constantine. Authors Ellen Robson and Dianne Halicki even wrote about the mysterious figure in their book "Haunted Highway, The Spirits of Route 66." Seat number four is the favorite of the Poncan ghost, who also wears a dress, sweater and old-fashioned shoes. This young woman has appeared quite frequently for theater workers and when spoken to, she sits quietly and appears to be watching something no one else can see. Cain’s Ballroom has been providing a good time to Tulsans since 1924, and the spirits that call this popular music venue home seem unwilling to give up the splendor of the past. Located in the heart of downtown Tulsa, Cain’s ballroom was the site of Bob Wills & The Texas Playboys' first regular radio broadcast. The venue’s nickname—Home of Bob Wills—is more accurate than you can imagine, as Cain’s Ballroom is reportedly haunted by the ghost of Bob Wills himself. He is joined by a woman known only as the lady in red. Both employees and visitors have reported seeing, hearing and feeling the presence of this mysterious woman. Cold spots, footsteps and slamming doors continue to haunt Historic Fort Reno. Established in 1874, the area has been a fort, remount depot and German prisoner of war camp during WWII. Though no specific spirit has been identified, visitors to the fort have encountered a number of strange things including faces in the windows, water faucets turning on by themselves in the visitor’s center and mysterious orbs showing up in photographs. This ghostly attraction in El Reno is also home to the monthly Fort Reno Ghost Tour where visitors are split into groups, given a lantern and led on tours throughout the grounds, buildings and cemetery. Paranormal researchers lead the group and report their findings. Fort Reno also has several annual events. At the Fort Reno Candlelight Tour, re-enactors demonstrate what life was like on the fort from 1874 to the present. Re-enactors also take on specific roles of those buried in the Fort Reno Cemetery during Fort Reno Tombstone Tales each year.